Let's face it -- no one ever in the history of hair has gone on record raving about the having luxurious, parched tresses. Dry, crunchy, crispy hair isn't cute. If you have chronically dry hair, your products may not always be to blame. Do you drink enough water? One of the keys to shiny, healthy, soft, and strong hair is drinking water. If your hair is dull, brittle, and prone to breakage, think about this -- how much water do you consume daily? Chances are, with the barrage of beverage options out there, you're not getting enough. Your hair shafts are comprised of about 25% water. Let's do some quick math here... If you're dehydrated (not drinking enough water), you increase your chances of hair breakage by oh... 25%? I don't know about you, but I can't take those chances. So drink up. Some sources say drink 64 ounces a day (approximately 4 "regular" sized bottles), while others say drink half, or double your body weight. My advice? Whatever you currently drink, double it every week or so until you reach an amount that is comfortable for you. Your hair, skin, and insides will thank you. Although we naturals love cowashing, every once in a while we need to break out the shampoo. One of my favorite reasons is summed up quite efficiently by Jc of The Natural Haven: "In the grand scheme of things, shampoo will remove more oil and dirt than conditioner, conditioner will remove more oil and dirt than using plain water." While cowashing is a great alternative to always using shampoo, it doesn't quite get all the buildup and eventually, your hair will not respond the same way to the cowash (due to buildup). Additionally, shampooing makes your conditioners work better. The general idea is that hair carries a slightly negative charge that is enhanced by use of a shampoo with a negative charge. Conditioner has a positive charge, and we all know that opposites attract. The ingredients in regular and deep conditioners are designed to stick to the hair, smooth the cuticle, and fill in chipped areas. This functionality and improved softness is enhanced with the use of shampoo. Steaming is a great way to get super soft hair, regardless of texture or type. Steaming the hair gently lifts the cuticle and allows the warm water to penetrate the hair, hydrating it thoroughly. Hydrated hair is soft hair, and soft hair maintains a proper moisture balance provides optimal elasticity. Steam treatments can be done on wash days, mid-week, before, during, or after deep conditioning. They're convenient and easy to do. Depending on your budget, you can spring for a tabletop steamer like the ever popular Huetiful, or grab my personal favorite, the handheld Q-Redew. You can also get your steam on for free by letting your hair hang loose during your next shower, or spritzing it with water and covering with a plastic cap (or Target bag) and sitting under a dryer, or using a blow dryer attachment to put indirect heat on your head that will cause steam. Do you deep condition every time you wash your hair? If you don't, you should. It's the single piece of advice that unites all naturals, regardless of regimen and hair type. Deep conditioning does a mane good, in terms of getting super soft, hydrated, strong, and moisturized hair. The first step in maintaining moisture and hydration is using a leave-in. LOC, LCO, LCB, LOB, ABCDEFGHIJK..... The acronyms that are meant to guide you in layering products are often more confusing than helpful. But the way you layer your products can mean the difference between soft, hydrated hair and a crispy mess. Generally speaking, the first step in maintaining moisture and hydration is using a leave-in. Whether it be extra conditioner (like Aussie Moist), or a product formulated specifically to be a leave-in, having a product that is a water-based mixture of fatty alcohols, emollients, and humectants is the first line of defense in maintaining soft hair during styling. After your leave-in should come a moisturizing product, like a hair lotion, or moisture butter blend (also water-based). This product will help lock in the hydration from your leave-in, and prime your hair for styling. If your hair responds well to pure oils and butter, sealing after this with an oil or butter of your choice is a great next step. After that, your hair is primed for whatever styling product you choose. 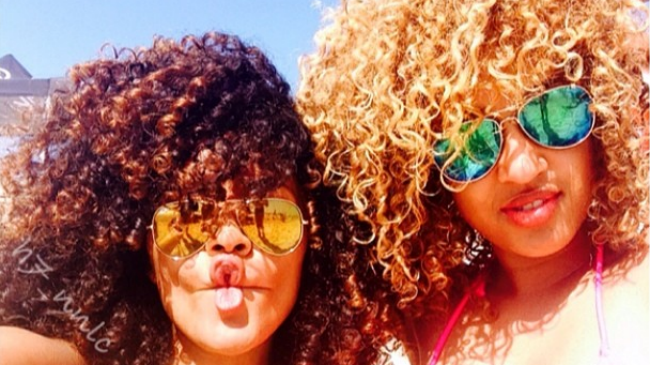 How do you keep your curls soft for summer?